I’ve been toying with the idea of making my own bucket list after I have read a touching story of a woman stricken with cancer who’ve decided to finish each wish listed on her bucket list. She never got to finish everything, but she did manage to make an impact to people around her. 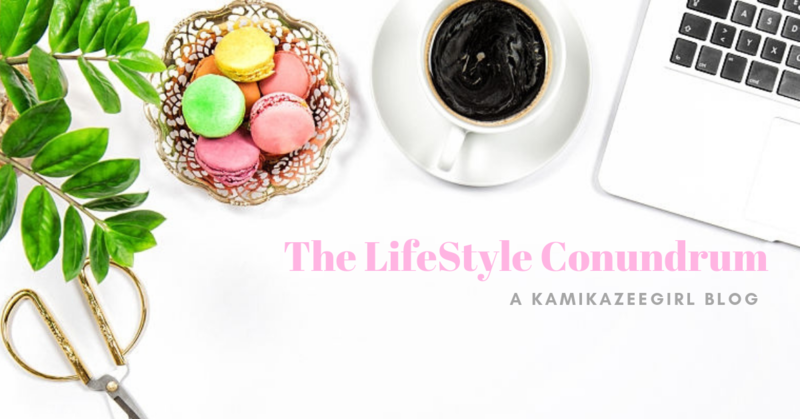 I always thought that I had a good life–yeah, it can be a bummer five days out of seven, especially when I am inundated with career, financial and health worries. I tend to be melodramatic and passive at the same time, and it depresses the hell out of me when things don’t happen when they should be. At 31, I believe that I have yet to reach my potential, never mind that I am already at mid-life but my slight (!) immaturity has made me believe that I have yet to get what should be rightfully mine. 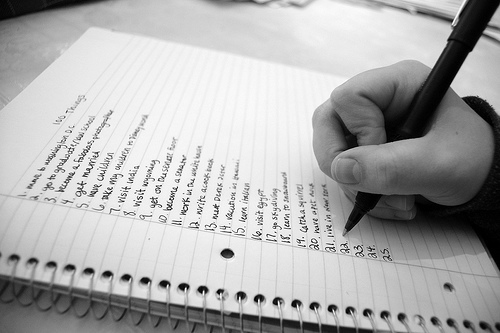 While doing my bucket list, I keep thinking that it sounded more like a wish list than a list of things that I will do before I crossed on to the Great Beyond. Reading it over and over last night, it sounded like it was written by 3 different persons, each with their distinct likes and dislikes. 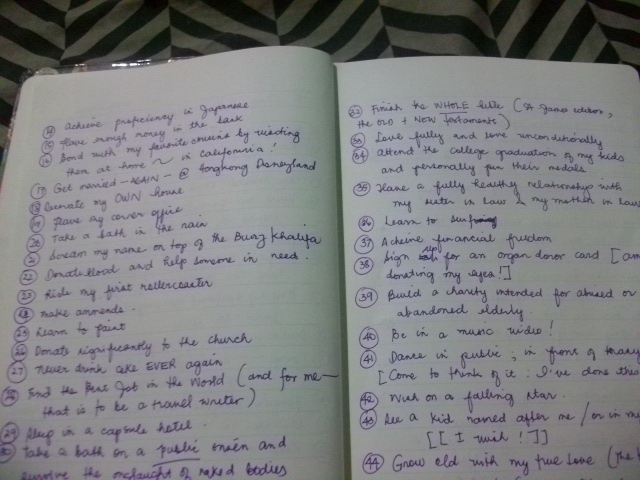 It was like I was writing a bucket list for 3 persons, instead of one–which is myself. Haha. 5. Have a short story published –> I realized I’ve done this already. When I was 21 or 22 years old, I joined a short story writing contest in a local publication and won the humorous category. The story was about my (then) cat, Spark. I should have written that I dream of joining the Palanca. 10. Fall asleep under the cherry blossom trees –> March 10, 2013 Taipei, Taiwan I didn’t exactly fell asleep but I had a grand time lounging under the Cherry Blossom trees planted at the CSK Memorial. 16. Shave my head and look effing good BALD. 18. Lose weight and have a BANGIN’ BOD — then celebrate it by doing ANY of these things: a) pose for FHM b) do a Kate Winslet (paint me wearing this…wearing only this) HAHAHAHA! 23. Scream my name on top of the highest building in the world : can we make it “one of the highest buildings in the world?” March 10, 2013 Taipei 101, Taipei, Taiwan. 25. Fall in love with same person over and over again – when the DH had to undergo an operation for his gall bladder, it’s then I realized how much this person meant to my life. Sure, it’s a random operation, minor even — but the three hours that he’s been conked out cold during his operation was the longest three hours of my life. 25. Complete the El Camino de Santiago de Compostela (from the French side). 28. Write a book and be a published author. 29. Reconnect with my two cousins living in the States, two people who will always remind me of my favorite uncle. I know someday, in His own terms, I will check items from this list, one after another. goodluck! this inspired me to make my own bucket list..
Good luck Rye! I am sure you can do it! Hi Kit! Thank you for the visit. 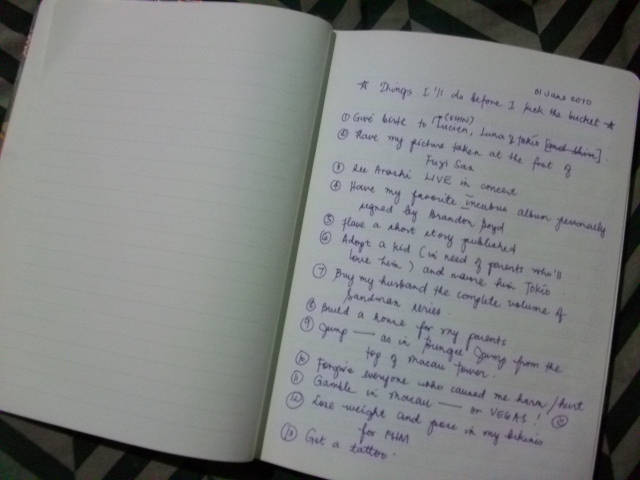 My list was also made because I was inspired by other people. You can do it! Take the first step! That’s always a good start 🙂 Cheers! Nice list! Not interested in Sky Diving? haha! I think its a must with all bucket lists.